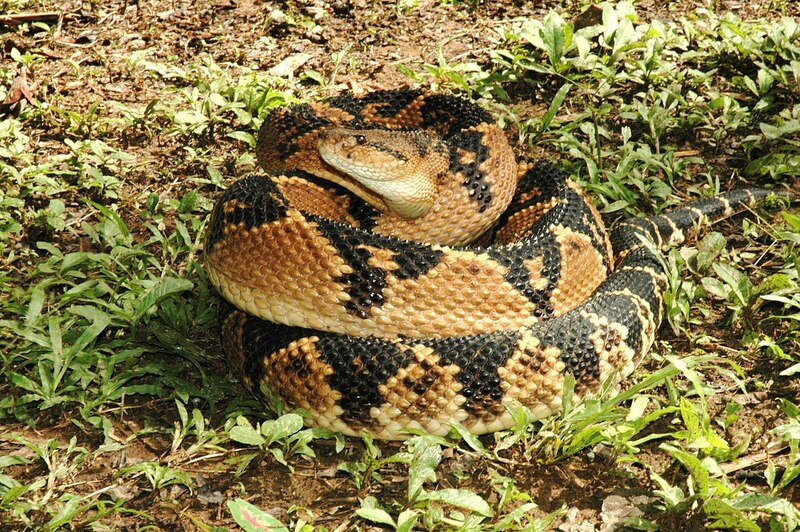 Common Names: Bushmaster snake; surucucu snake. Lachesis muta (Lach.) is prepared from the venom of the bushmaster snake. Those who need Lachesis experience an inner restlessness and agitation which results in extreme talkativeness, sarcasm, vivid imaginings, and passionate, intense behaviours. They are affected by heat, easily becoming hot. Skin or eruptions may develop a purplish discoloration. Physical complaints arise on the left side of the body and symptoms improve following a discharge, but worsen if discharges are suppressed. They tend to be hypersexual. Mental – emotional and physical symptoms worsen during or after waking from sleep and alcohol may be craved. Passionate and inclined to jealousy. Suspicious – even to the point of paranoia. Aggressive and prone to hatred – seeks revenge. Pain in the top of the head or on the left side. Left-sided throat pain or pharyngitis. Difficulty in swallowing, especially saliva and other liquids. Dislike of high or tight collars, or throat being touched. Palpitations or chest oppression worsened by lying on the left side. Premenstrual syndrome with irritability, depression, jealousy, and headache. Hot flushes at the time of menopause. Sleep is impossible on the left side. Sudden waking with a feeling of suffocation, especially when first falling asleep. Hormonal difficulties with heightened sensitivity to heat. Lachesis muta (Lach.) is available from our online store as a single remedy, and as part of the following Complex (combination remedy): Sore Throat.